La Frenz Montage – One Smooth Glass of B.C. Red! Hello wine lovers and happy wine Wednesday! I hope you are having a great week so far! Getting straight to the point today, the wine up for review is La Frenz 2011 Montage from Rattlesnake Vineyard. I had the pleasure of meeting and interviewing winemaker Jeff Martin last month and sampling his glorious wines. Truthfully, there wasn’t a bad one in the bunch – excellent, fruity and enjoyable wines. 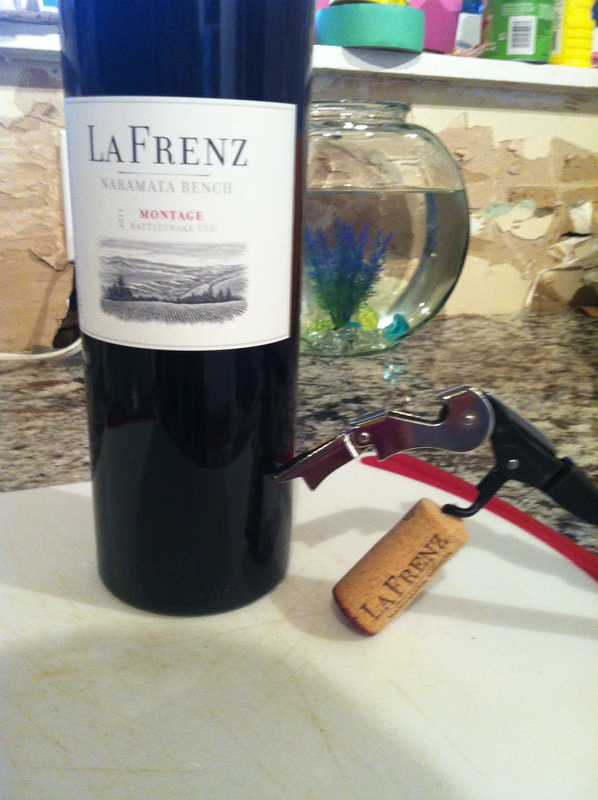 La Frenz Montage is a red blend made up of Shiraz, Merlot and Cabernet Sauvignon. In the glass it is a deep ruby colour with aromas of blackberry, black currant, vanilla, earthy spice and oak…delicious! On the palate, the wine is dry with medium acidity, medium tannin, medium body and a medium plus flavour intensity with notes of blackberry, some nice chocolate and vanilla, black cherry and again some black currant. This wine is juicy and fruit forward. It does not disappoint at $22 per bottle and you can still order this lovely bottle online at the La Frenz website. This 2011 Montage blend is a Girls Go Grape “Hell Yes” wine. It is creamy and smooth and rich – so good! GGG “Hell Yes” for taste, quality and price. La Frenz uses biodynamic and sustainable grape growing practices which is a “Hell Yes” all on its own! Jeff Martin is an outstanding winemaker with a clear vision for quality.